Dirt Rally isn’t a racing game. Well, okay, it is in that it has cars, a start line and a bloke that says ‘across the finish’ but it has more in common with adventure games than you might think. It’s Dark Souls on wheels, basically, where the track is Lord of Cinder and your co-driver’s pacenotes are letters left by people who’ve failed hard before you. It is you versus the world. Bad cambers are archers, ready to snipe and knock you off course. A hairpin turn is a lumbering golem with a brutal hook that has you turning on your tail. My cunning analogy falls down a little when you realise that your co-driver isn’t some idiot out to actively deceive you (‘big jump’ should be taken literally in Dirt Rally, but with a cocked eyebrow in Dark Souls), he’s filling your brain with information that you don’t even realise you’re missing. ‘Don’t cut’ should be taken as gospel, and its absence means ‘cut at your own risk’. Learn the world and you learn what you can and can’t get away with. But like From Software’s greatest, your mistakes are your own fault. Repercussions ripple out beyond that one single moment you come unstuck. And it’s largely because you didn’t give the guy with the clipboard enough attention. Subscribing to the Forza Motorsport model of podium or bust is a fallacy, so you play the long game in Dirt Rally, though that’s actually true in more ways than one. Codies’ own time rewind feature has been given the flick, so buffing out any mistakes means a full restart and gambling a bonus reward if you feel that you could’ve done better. But, it’s best to consider that while you might be 34 seconds behind the driver in front at stage end, they’re just one heartbeat away from jamming their radiator into an immovable Welsh rock, their failure catapulting you up the leaderboard. It’s entirely possible to languish in 7th place at the start of a country and then jump up the rankings by the penultimate course. Racing games are so often bereft of natural personality, especially ones that veer towards simulation. The Forza team used the (now) ex-Top Gear team to inject life into its showcase of shiny motors. Project Cars is basically a spreadsheet. Dirt Rally takes the fact that rallying is dangerous, and uses the co-driver to great effect – I’d argue that he’s primarily responsible for building so much of the atmosphere as he’s filling in the blanks that you don’t even know you’re missing. Your co-driver is more than an extra pair of eyes and ears, he’s your life support. Without him you’re fumbling through a snowy forest strapped into a 300bhp piece of kit with no sense of what to expect. What’s really magic is how dynamic he is, both in building atmosphere and on a technical level. Get a good pace on and he’s more excited, earnest, his voice straining over the whinny of the turbo. Pick your way through at more of a canter, and his voice drops, patient, but there’s a hint of encouragement underneath. He is the narrator, but one that’s far better than Travis Pastrama or Christian Stevenson who only pipe up in a cutscene. This chap’s reacting to you. The graphics may be among the best of this generation and the handling superb, but it’s the stoic guy reading notes, painting a picture of what you’re going to see, that really sells it for me. 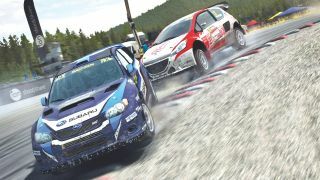 Dirt Rally’s a return to form, a move that I reckon has taken Codemasters about a decade to properly sort out. Codemasters have struggled with the way their racing games are presented, going from a simple menu to a full-blown paddock area, replete with caravan or garage for you to fiddle with your wheels (Dirt 2, 3), and then back to simple menus (Grid Autosport) since Dirt on the Xbox 360. Pointless narrators butting in with suggestions, stoking rivalries between you and a name on a leaderboard with spiky catchphrases – all a thing of the past. Next time you’re in your Polo’s cockpit, nudge the right thumbstick over and take a look at your co-driver. He’s the reason you – and the game – are so brilliant.